Freediving UAELatest NewsCan We Create Sunscreen That Protects Both Humans and Coral Reefs? Earlier this month, Hawaii banned sunscreen. 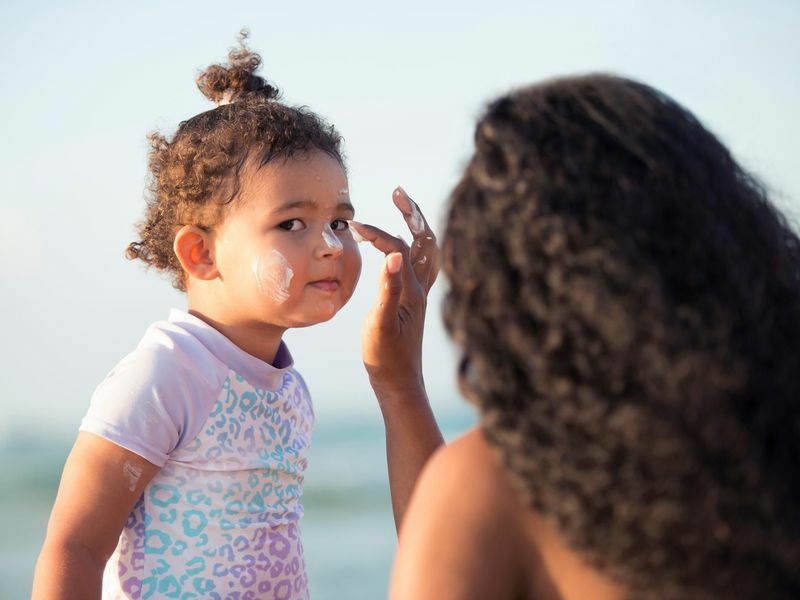 Not all sunscreen—just the kind containing the active ingredients oxybenzone and octinoxate—but that encompassed most of the major brands, from Banana Boat to Coppertone. The reason for this seemingly perverse law, which goes into effect in 2021, was recent research confirming that the lotion we slather on to protect our skin can also do grave harm to the world’s coral reefs. The Hawaiian ban was based on a 2016 study by Craig Downs and colleagues at the Haereticus Environmental Laboratory, which showed that these two chemicals were to blame for slowing coral growth and increasing the rate of coral bleaching. (Bleaching happens when conditions like temperature change so dramatically that corals turn completely white and the symbiotic algae living in their tissues flee their homes.) In February, Downs told The New York Times that sunscreen and other chemical wash-off through showering and swimming plays a bigger role than climate change in damaging coral reefs. But just how conclusive the evidence on sunscreen’s impact on coral reefs—and whether consumers should switch to “reef-friendly” sunscreens—remains disputed. According to marine ecology researcher Cinzia Corinaldesi, who has studied the impact of sunscreens on coral reefs since 2003, the problem is that “unfortunately, oxybenzone is not the only harmful ingredient of sunscreens.” Other UV filters, including zinc oxide, are proving to have an impact on coral bleaching—and the ban does nothing to prevent these. There are two kinds of sunscreen ingredients on the market, which work in different ways. Physical sunscreens, also called mineral or inorganic, block or reflect both UVA and UVB rays; zinc oxide and titanium dioxide are the two most common physical sunscreen ingredients. On the other hand, chemical, or organic, sunscreens, which typically include oxybenzone, octinoxate, avobenzone and PABA as ingredients, absorb and reduce UV rays’ ability to penetrate the skin. Some sunscreen formulas include both kinds of sunscreen actives. While it’s unclear to what extent exactly bleaching actually affected by sunscreen compared to other factors, an estimated 6,000 to 14,000 tons of sunscreen go into coral reef areas each year. And this is enough, says Corinaldesi, to make an impact. She would know. In 2008, Corinaldesi and her colleagues the Polytechnic University of Marche in Ancona, Italy, found that three individual chemical, or organic, sunscreen ingredients—oxybenzone, butylparaben and octinoxate—can bleach coral reefs. Considered the first scientific evidence on the impact of sunscreens on coral reefs, the study confirmed what some scientists and locals had witnessed: that swimmers, surfers and divers in popular beach destinations were affecting marine ecosystems. On the Yucatan coast in Mexico, for example, resort managers had noticed living species were dying off in enclosed pools known as cenotes where people regularly swam. Since the 2008 study, the evidence suggesting chemical, or organic, sunscreen negatively impacts coral reefs has only gotten stronger. And yet organic filters like oxybenzone still dominate the sunscreen market. That’s largely because the alternative—mineral or physical sunscreens containing ingredients like zinc oxide and titanium dioxide—leave behind a heavy white cast that can look ghostly on people with darker skin, and they’re often greasier and tougher to blend in. A review of research on studies related to sunscreen and coral reefs by the International Coral Reef Institute suggests that further research is needed. “To date, experiments have largely been undertaken exsitu and there are concerns that they may not properly reflect conditions on the reef, where pollutants could be rapidly dispersed and diluted,” the report states. For example, the report states, concentrations of sunscreen chemicals used in some research work have been higher than those in real coral reef environments. This may skew the perceived impact of reef damage. A review of sunscreen research published this month in the Journal of the American Academy of Dermatology also concludes there’s not enough evidence to suggest certain sunscreen ingredients are harmful to the environment. Dermatologists suggest people should wear sunscreen on a daily basis because UVA rays (which penetrate deep into the skin) and UVB rays (which burn the superficial layers) can wreak havoc on our skin, and they can both directly contribute to skin cancer. In fact, one in five Americans will develop skin cancer by the age of 70, according to the Skin Cancer Foundation. Most skin cancers are caused by the sun, and some are deadly. For consumers both interested in protecting their skin from sun damage and protect the environment, what’s the right choice? Unfortunately, right now there aren’t many alternatives on the market. One of the reasons is that, since it claims to prevent skin cancer, sunscreen is considered a drug by the Food and Drug Administration, meaning the process for approving sunscreens is more rigorous than other cosmetics. There are only 16 FDA-approved active sunscreen ingredients, and only a handful of those are commonly used, so the choices are limited. The last time the FDA approved a new sunscreen active ingredient was in the 1990s, and currently, eight new ingredients are pending approval. By contrast, the European Union allows nearly 30 active sunscreen ingredients. An effort called the Public Access to SunScreens Coalition has also been working to improve and accelerate the FDA process for new ingredient approval since 2012. But for the time being, the group says Hawaii’s ban is detrimental without viable replacements. “A ban on these ingredients without adequate, FDA-approved alternatives and without extensive research demonstrating that this action is needed to properly balance environmental impact with the risk to public health from inadequate UV protection is premature,” the group said in a letter to Hawaii governor David Y. Ige before the legislation was signed into law. But you can’t rely only on sun-protective clothing, Desai notes. “Sun-protective clothing does not replace sunscreens,” he says. After all, some skin cancers, like basal and squamous cell, happen most often on the face, arms and necks—areas exposed to the sun and which are not always easy to cover up with clothing, especially on the beach. In the meantime, scientists are working on a few possible solutions. One research team from the College of Pharmacy at the University of Florida is working on creating a “natural sunscreen” from shinorine, a UV-absorbing ingredient harvested from algae. Another team in Puerto Rico is working to create biodegradable beads that could soak up oxybenzone from oceans, as highlighted in Popular Science. The moment you step into the ocean, the oxybenzone you’ve slathered on your skin begins to seep into the waters around you. It doesn’t take long for it to build up to dangerous levels, the researchers reported last summer at the American Chemical Society national meeting. The absorbent beads Roman-Velazquez and his team have created are a bit bigger than poppy seeds. Made from materials derived from algae and chitin, the beads would take about a month to completely disintegrate. In testing the beads for oxybenzone, they were able to remove 95 percent of the contamination within one hour. In theory, the beads could be used in conjunction with other efforts in high-tourism areas. “After people bathe in the beach all day, we can probably develop a process where we have a boat and drag these beads around [within a net] before [the chemicals] wash toward the corals,” Roman-Velazquez says. And while their research—which they hope to publish as early as this year—has focused on oxybenzone, Roman-Velazquez says his team is hoping to test other sunscreen ingredients for future studies. He adds that while neither his team’s beads nor Hawaii’s ban offers a simple solution to clear the corals of damage, it’s an important measure. “Tourism is so big in Hawaii, so they should be concerned about protecting those resources,” he says.